It would be nice if you had an endless supply of money and you could do whatever you fancied without worry about the expense. In reality, this isn’t possible for most people, even if you have a lot of money, wasting it and not budgeting is not a wise use of your money. However, it is still important that you make memories with your children, especially in the summer, but knowing how to do this on a budget is important. 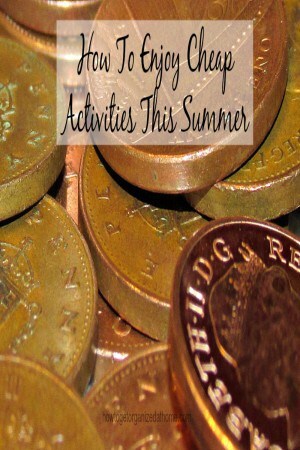 Having fun and utilizing cheap activities this summer makes so much financial sense! It is essential that you budget for the activities that you want to do, this will mean that you are not putting the activities on credit or borrowing from another category, you might be planning on paying it back, unfortunately, this seldom happens. You must work out what you can afford and stick to this budget, it might mean that you have to get adventurous to find things to do within the amount of money available, but it is important that you don’t go over the amount that you have specified. Travel, this must include fuel costs or bus fares, whatever expenditure that you pay out to get to the activity, as well as parking costs too. Food, you must include the cost of food and drink in your activities. It isn’t always easy to work out in advance how much you will need for these items as it will depend on where you are and what you are doing. Without budgeting, this expense could blow your budget completely. Entry to attractions, unfortunately, this isn’t cheap and you have to prepare for these costs; check out the prices before you travel, this will ensure you are doing activities that do fall within your budget. It is possible to save money with family outings, but it does take some preparation time. You need to look for vouchers and offers on attractions that you want to visit, to see if this could save you some money. Often you can find these offers but check out the terms and conditions to ensure that they will save you money and not an offer that isn’t as good value as first imaged. If you are going to go out for the day, it is cheaper to prepare food and drink to take with you, this way you will know the cost of the food in advance. If you have some money in your budget for an ice-cream each then this makes a nice treat, but if you haven’t the money in the budget, don’t sit outside an ice-cream parlour! Don’t forget local areas to where you live, there might be a nice park where you can go and play a ball game or two with your family; this is a great cheap way to have some fun with your family. Finding fun things to do with your family doesn’t have to cost lots of money; when I was studying for my degree I would take my kids to the park so they could play and have fun and I could sit and work, it was the perfect compromise. Fun things to do that are free do take some imagination, but they do make some fantastic memories that you just don’t always get with some activities that cost a lot of money. Therefore, if you are looking for cheap fun activities to do with your family that doesn’t break the bank, it is possible but you must budget and discus the restrictions with your family, so they understand the pressure and they are then less likely to ask for expensive treats or days out. What is your best tip for cheap activities this summer? If you are looking for more articles on this topic head over to the landing page where you will find links to other posts about budgeting. I wrote an article I think you will like. 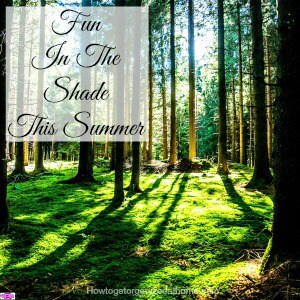 Fun In The Shade This Summer. If you are active duty definitly check out the Itt center. They sometimes have fantastic tickets you can only buy there. Another cheap idea is the $1 or .50 cents movies. That’s a favorite at our local theater. Great tips! Thanks for linking up with us at the #HomeMattersParty! Hope you’ll join in again next week!